According to the paper, women who have overplucked their eyebrows to follow an earlier fashion trend can now buy brush on fake eyebrows for a thicker Paloma Faith/Elizabeth McGovern look. I suppose it can’t be worse than a woman I knew whose eyebrows were so badly dyed ( and somewhere rather exclusive) that she looked like Groucho Marx. But there is plucked and plucked. Had I not commenced to pluck my eyebrows at the age of thirteen, there would have been little shape and I’d have tripped over them. Secondly I was deeply influenced by a browline running through my father’s side of the family from the lady known as “the Spanish grandmother” (black Irish actually, allegedly descended from the Spanish sailors in the Armada whose ships were blown off course when they reached the Irish Sea from round the north of Scotland, winding up wrecked on the west coast of Ireland) Surrounded from an early age by fashion and film, I knew how I wanted my eyebrows to look. I overdid it when I was 13 (I read that plucking a few hairs from the centre made you looked younger and obviously I was maturing fast !) which led to a year of Vaseline and brushing with the baby’s toothbrush then recommended for the eyebrow version of “100 strokes to make them beautiful”, just like the princess brushing her hair in the story. But I can’t help wondering how you’d feel locked in a clinch with Mr. Wonderful with the risk of leaving fake eyebrow on his face ? You see I am old enough to remember the Wandering Shoulder Pad of the Eighties , when your friend told you you looked so much better with the bigger pads in, of course they’d stay ! So off you went and had a lovely time till you caught sight of yourself – at the other end of the evening – shades of the Hunchback of Notre Dame or more worrying still, a third breast. 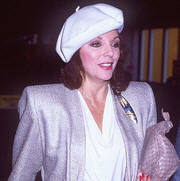 Shoulder pads went everywhere. Years before, a woman I much admired but who dressed very plainly was chosen to play a rather more glamorous role in the local theatre and I went to see her. She looked wonderful, discreetly padded to fill out the strapless evening dress , well made up including false eyelashes and her hands emphasised by impeccably manicured false nails. She was also very funny, sadly funniest when she flung out her hand in a magnificently cod theatrical gesture and all her nails fell off . While my friend Wendy who had the most beautiful colouring – black hair, dark blue eyes and white skin and legs from heaven to breakfast – told about sharing a dressing room with a famously curvaceous popular starlet about whom Wendy, a lesser mortal was a bit shy, until the lady arrived in the dressing room they shared and began to change, taking out of her well filled bra cotton and animal wool, several pairs of clean tights and a great deal of tissue. Wendy couldn’t keep her face straight, the star was blessedly down to earth about it and they became friends. But I wonder what she did on a heavy date ? I don’t mind wearing a lot of makeup (this is as close to fake as I shall ever get) but it’s got to “fade “ nicely. I can’t stand the black tramlines, false eye lashes like mucky park railings and other coloured constituents that blur and goo. I think you’re really lucky if a man doesn’t mind but if I were him, I would. The plain fact is we’ve got the fake mixed up with the real. Most of the clothes and shoes (oh those horrible shoes) that have been in fashion for the last several years are standing still fashions and I don’t do much standing still. Just as most of the make up is for clubs and cameras and pretty heavy handed at that. Heaven knows, I don’t fall out of bed and wear nothing on my face any more but whatever I wear, I want to stay there and work for me, rather than end up on somebody else. Why don’t you stop and make the best of what you’ve got instead of taking it down only to try and build it up again artificially ? As mankind does to the environment, so woman does to her face. Thank you Anna. I really look forward to reading your posts, and this latest one had me laughing out loud!😄 especially the Groucho Marx reference. Yes. I don’t understand why everything’s so fake when more natural is better. The fashions of the last few years are horrible as is throwaway mass produced fashion . I find vintage clothes and look in charity shops, they’re kinder to the environment and cheaper too!